Single axis trackers are preferred for their cost performance ratio. Due to the fact it can change its degree (relative to the ground) it can always perform at maxium productivity relative to the position of the sun. Sonnen's dual-axis photovoltaic tracking systems align the solar panels to the optimum angle to the sun for power generation. 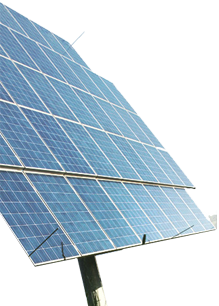 This process allows the energy usually generated using static photovoltaic panels to be increased by as much as 45%. Optimal alignment is made possible by a precise astronomical control mechanism which can plot the course of the sun from any geographical location at a given time of the year. 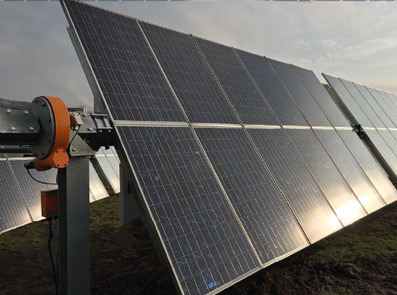 sonnen_system trackers have repeatedly proven that they can consistently deliver improved levels of photovoltaic power generation in a wide range of conditions. Precision engineered in Germany, all Sonnen Systems units are manufactured to the highest possible standard ensuring lasting quality. The Sonnen Systems is constructed with the highest-quality components and materials available and is designed to operate for 20+ years, even in extreme climate conditions. The Communications Hub empowers the system operator to fully monitor and control the Sonnen System tracker from anywhere in the world. Via a standard Internet connection, all operational data, system messages and power generation performance statistics are delivered in real time to the system operator. The Communications Hub detects faults as soon as they develop minimising any possible operational down-time.